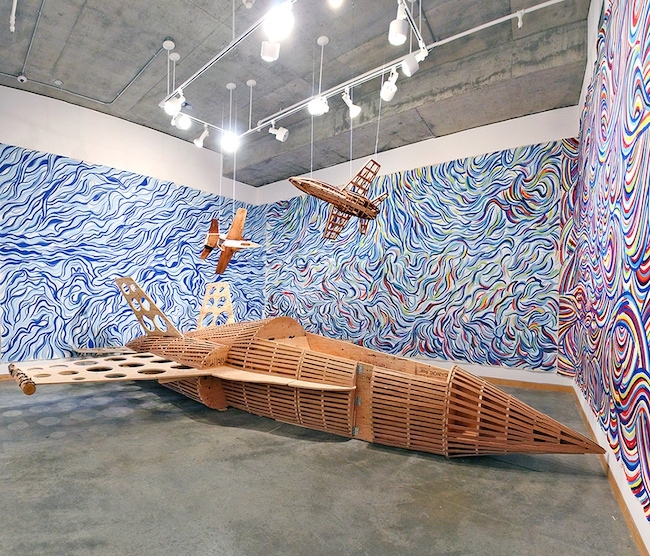 In July 2013, Calgary artist Michael Markowsky became the first person to make artwork while travelling faster than the speed of sound. As part of the “War Artist” Program, he created 100 postcard-sized landscape drawings while flying in a Royal Canadian Air Force CF-18 ‘Hornet’ jet plane around CFB Cold Lake. In late September, The Calgary International Film Festival will unveil a 30-minute documentary film that follows Markowsky’s journey to create art under the most challenging of circumstances. The film captures the rigorous tests and training that the artist went through leading up to his once-in-a-lifetime, 1½ hour-long flight. Another short film by Michael Peterson entitled The Whale premiered at the prestigious Cannes Film Festival in May. Peterson is most well-known for his feature-length comedy hit Lloyd the Conqueror that featured comedy veterans Brian Posehn (Seinfeld), Harland Williams (There’s Something About Mary) and Mike “Bubbles” Smith (Trailer Park Boys). Artist Michael Markowsky and Director Michael Peterson will both appear at the film screening, which begins at 5:30pm on Sunday, September 27th at the Junction Theatre Grand (608 1st Street SW, Calgary).